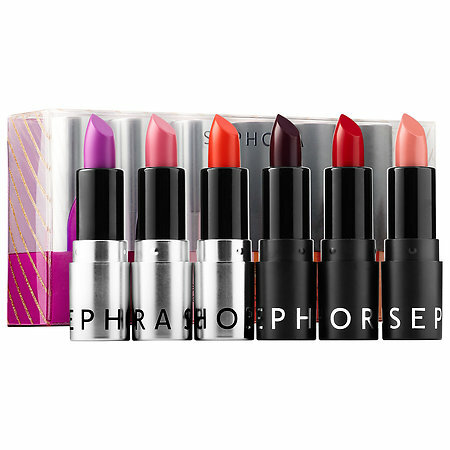 This set of six mini SEPHORA COLLECTION The Mini Team Rouge Cream and Rouge Shine Lipstick colors makes a great gift. It's small enough for a stocking stuffer, a Secret Santa gift or as an add on to a larger gift. It would be a great gift for an office party or for a relative, or even for one of your beauty junkie friends! Rouge Cream is a new hydrating formula that provides improved coverage, comfort and intense pigment. The creamy texture softly glazes the lips, imparting just the right amount of color and sheen. Rouge Shine offers heightened transparency, subtle color, and brilliant shine. The Hydra-Comfort complex blend of moisturizing oil and anti-oxidant Vitamin E ensures optimal comfort while nourishing and protecting the lips. The precise product design enables a flawless lip definition. These lipsticks are wonderful. They go on creamy, with lots of pigment and stay on for a long time. I like them a lot. I think this set would make a great gift for anyone who LOVES lipsticks! That is someone like me. It's an adorable little set. You could even purchase it for yourself, because the colors are so varied that they really color all the sprectrums. This set would make anyone happy. Add it to a gift, give it as a Secret Santa gift or just give this as a stocking stuffer. This set is sold on www.sephora.com and in SEPHORA stores. Like SEPHORA on Facebook: https://www.facebook.com/Sephora?ref=br_tf; Follow SEPHORA on Twitter: @Sephora, Follow SEPHORA on Pinterest: http://www.pinterest.com/Sephora/; Follow SEPHORA on Instagram: http://instagram.com/SEPHORA#; Subscribe to SEPHORA on YouTube: http://www.youtube.com/channel/UC9YX5x_VU8gfe0Oui0TaLJg; Follow on Google+: https://plus.google.com/+ Sephora/posts; Follow SEPHORA on Wanelo: http://wanelo.com/sephora and Follow SEPHORA on Tumblr: http://theglossy.sephora.com/.